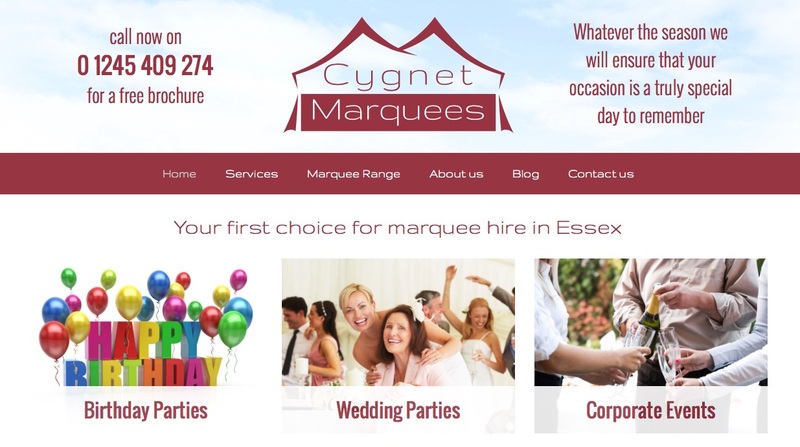 Essex-based marquee hire business, Cygnet Marquees, looks set to benefit from a major overhaul of its website that has been taking place in recent weeks. The new website, launched on 18th June, has just gone live and is already receiving favourable comments from site visitors thanks chiefly to the improvements that have been implemented. As well as being generally easier on the eye of the user and more responsive, the improvements have enabled Cygnet Marquees to display a greater selection of their services on offer, thereby making the user experience a much better and more positive one. With so much business advertising activity carried out on the internet, Cygnet Marquee’s owner, Mark Hyams, knows that his website is absolutely critical to the success of his business. Potential customers in need of a marquee for hire for their special day will use search engines such as Google to seek out local marquee hire companies. Then they will quickly check out the top websites identified from that search to identify those marquee hire companies that look and sound the most appealing before contacting just two or three of the companies to compare prices and discuss their needs in more detail. Mark has steadily grown the Cygnet Marquee Company and brand over 23 years. Operating out of Canvey Island in Essex, the business now serves the people of Essex, Kent and even North London! Mark attributes the success of Cygnet Marquees to the steady accumulation of expertise and skills, and to the passion for excellence that enables him and his staff to deliver the very best marquee hire to every single customer. Of course, that dedication to quality service and quality products has to be reflected in the new Cygnet Marquees’ website and it does just that. The website now displays a much-improved range of information about all the services they offer, including not only the choices of marquees available but all the vital support equipment including flooring, linings, lighting, heating and toilet facilities. Many visitors to the website may not be fully aware of the wide range of events for which a marquee can be provided and so the improved website identifies these events and explains the benefits, including birthdays, weddings, bar mitzvahs, Christmas, corporate and sporting events. With mobile phones increasingly being used by potential customers to access websites, it’s now more important than ever to ensure that websites are mobile-friendly. The Cygnet Marquees website has been improved so that mobile phone users can now access the information they need quickly and easily. Cygnet Marquees aims to deliver to its clients a truly positive and memorable experience for their special occasions. Its vastly improved website is now a key part of that experience.